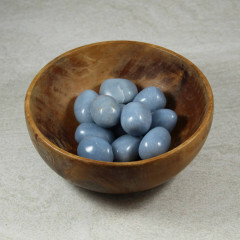 A gorgeous light blue mineral, commonly sold tumbled or carved into decorative objects. 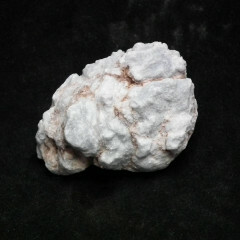 It is also found rough quite often, but rarely used for jewellery. A commonly used trade name for Blue Anhydrite, which is a fairly uncommon mineral that is similar to Gypsum. Anhydrite actually changes to Gypsum in water, which is why this stone is relatively uncommon – this is reversible with a fairly small amount of heat in certain circumstances. Due to its Calcium content, this stone can be ground up and used as a soil treatment, and is used in construction and building materials like plaster, along with Gypsum. Synthetic Anhydrite is actually a side product of the production of Hydrofluoric Acid, although this is far more likely to be used in construction materials than tumbled! It is found in a range of places, especially in arid climates, where water has not turned the stone into Gypsum – Mexico produces some excellent specimens with a good blue colour. It is a relatively soft stone, and is not often used for jewellery for that reason. It is usually found tumbled, or carved into decorative objects, or cabochons for wirewrapping. It is thought to be a peaceful and soothing stone, which helps to connect the holder to a spiritual realm. Some people even believe it can help you connect to angels. Healers may use this stone with Seraphinite – another mineral named after angels – specifically Seraphs, the highest order of angels. It is associated with the throat and crown chakras.